Ear acupuncture has been shown to be helpful in relieving pain, muscle tension, anxiety, digestive issues (and much more); as well as symptoms resulting from stress, a variety of emotional disturbances, drug and alcohol addiction and exposure to traumatic events. The treatment is performed by placing thin, sterilized needles onto the surface of the ear. The treatment takes 30-45 minutes and is usually done in a group setting. Treatments are provided by a trained practitioner. Individuals often feel immediate relief and a decrease in tension and anxiety. Participants have reported sleeping better, and feeling a greater sense of connection with themselves. The risks of this procedure include: slight discomfort at the moment of needle insertion which usually subsides immediately afterwards, possible lightheadedness, possible fatigue, possible minor bruising, and potential for (very) minimal bleeding. 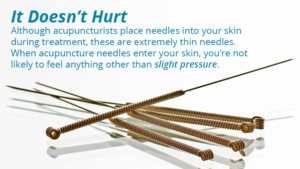 Acupuncture is a safe and effective form of medicine. 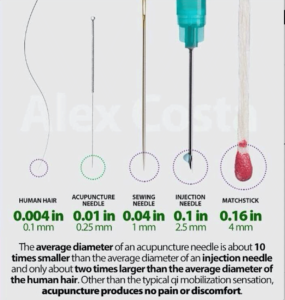 Complications from the clinical application of acupuncture are extremely rare and side effects, if any, are limited. Regarding acupuncture during pregnancy: Acupuncture has been used for thousands of years on pregnant women and is safe. There are many benefits of acupuncture treatments during all three trimesters of pregnancy; preparing the body for carrying the baby and helping to prevent miscarriage, treating common symptoms like fatigue, indigestion, nausea, headaches, insomnia, regulating the endocrine system/hormones, as well as the nervous system (anxiety, overthinking, worry/feeling overwhelmed). And towards the end of pregnancy acupuncture helps to prepare the body for labor and delivery, and when needed, there are specific points to aid in turning a baby from the breech position. 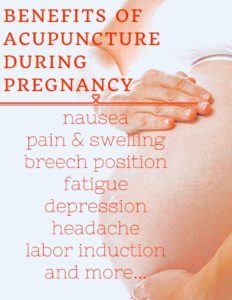 Having acupuncture once a week is an excellent way to stay healthy and calm, for everyone, including pregnant women. There is a commonly cited contraindication or precaution about the risk of needling individuals taking anticoagulants; which has not proven to be a realistic one; please do not hesitate ask if you have any concerns. Generally, cupping is combined with acupuncture, but can also be used alone. Like acupuncture, cupping follows the lines of the meridians and aims to open the channels, allowing qi to flow more smoothly. 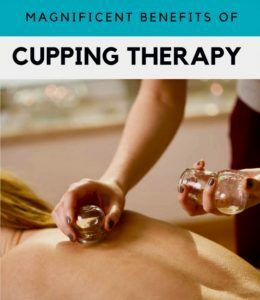 For this reason, cupping therapy is beneficial to all of the systems of the body. By creating suction / negative pressure, cupping can activate the lymphatic system, drain excess fluids and toxins, clear colon blockages, loosen adhesions, lift connective tissue (… away from the muscle, allowing the muscle to relax and “breathe”), and bring blood flow to stagnant muscles and skin. It is of the utmost importance, that you communicate to the practitioner(s), any physical discomfort or draping issues during the session. 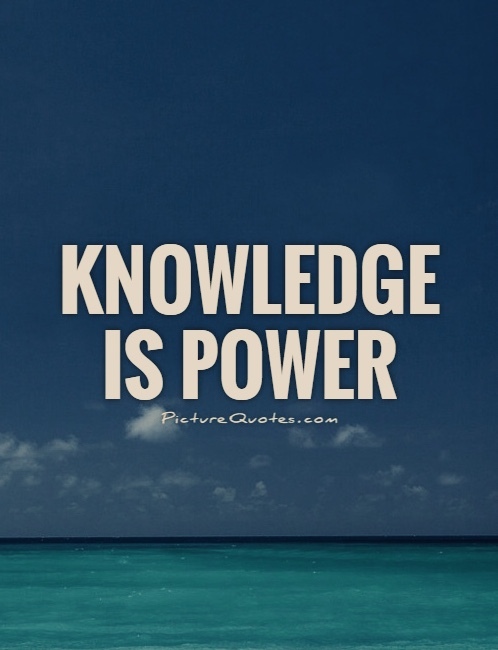 And that you understand the potential effects, contraindications and after-care recommendations. Soreness following treatment is common, as cupping therapy achieves a similar effect as deep tissue massage, but without the discomfort many people often experience. This is because, cupping uses negative pressure to access, and release tension from, the deeper layers of tissue. 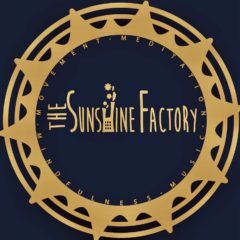 For this reason, most people find the treatment incredibly relaxing and enjoyable, and not at all painful. Although, similar to deep tissue massage, soreness after treatment is common, but usually only lasts a day or two; and that is dependent on following aftercare instructions, most importantly, drinking plenty of water. The suction method employed by cupping therapy often produces discolorations on the skin, which occurs from the release and clearing of stagnation and toxins from the body. Cupping DOES NOT CAUSE BRUISING. This reaction is not bruising, but cellular debris, pathogenic factors and toxins being drawn to the surface to be cleared away by the circulatory systems. The discolorations will dissipate in a few hours, to as long as two weeks after treatment. The timing depends on how dark the marks are, which is relative to how much stagnation was present in the area that was cupped, and also on other variables relative to an individuals lifestyle (for example: having a job which doesn’t allow the muscles that were cupped to be able to rest). Accompanying soreness, as well, is relative to the color of the marks and the amount of stagnation that was present. • After aggressive exfoliation, laser therapy or treatments that leave the skin irritated. You may feel fatigued the day after cupping as your body processes the toxins that were released from your treatment. DRINK PLENTY of WATER; doing so will help to flush out the toxins that get released during treatment. You should also do your best to avoid caffeine, alcohol, sugary foods and drinks, dairy and processed meats. After cupping, the skin is in a state of healing; making it more sensitive and fragile. Avoid exposure to cold, wet, and/or windy weather conditions, HOT showers, baths, saunas, hot tubs and aggressive exercise for 24 hours. Exposure to such extremes can produce undesirable effects, skin damage or inflammation; as such, care should be taken to avoid such situations. It is okay to shower after your treatment, but it’s best to wait at least 4 hours, and avoid extremes in temperature. Inversion tables can help to relieve lower back pain by counteracting the degenerative effects of gravity. Inverting on a regular basis can help to eliminate daily stress and tension by stretching spine and back muscles, allowing complete relaxation. Inverting allows for the benefits of spinal decompression*, without trauma to ankle, knee, or hip joints. ”Spinal decompression devices use the same basic principle of spinal traction that has been offered by chiropractors, osteopaths, and other appropriately trained health professionals for many years. 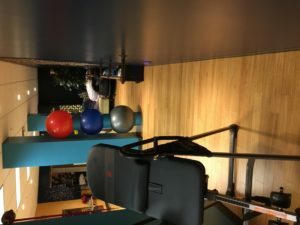 Both traction and decompression therapy are applied with the goals of relieving pain and promoting an optimal healing environment for bulging, degenerating, or herniated discs. 🔅 Create a negative intra-discal pressure to promote retraction or repositioning of the herniated or bulging disc material. Circulation is greatly enhanced through inversion. Incorporating time on an inversion table is an excellent way to recover from high impact, compressive, or rotational activities. The answer depends on you! You should begin with 1-2 minutes per session and advance only as you feel comfortable. Keep in mind that frequency (inverting more often) is more important than duration (inverting for longer periods of time). Over time, work up to 3-5 minutes or as long as it takes for your muscles to relax and release. While there is no predetermined time limit for using an inversion table, it’s important to listen and respond to your body and remember that inversion is about relaxation and enjoyment. Hiatus Hernia, glaucoma, high blood pressure (Hypertension), dizziness, bone weakness (osteoporosis, recent unhealed fractures, medullary pins, artificial hip joints or other orthopedic supports which are surgically implanted), cardiovascular insufficiencies in the limbs, acute head injuries, fainting spells, acute spinal injury, disorientation if upside down, weakness or frailty, retinal detachment, cerebral sclerosis, recent stroke or transient ischemic attack, heart and circulatory disorders for which you are being treated, acutely swollen joints, chronic sinusitis, motion sickness or inner ear disorders; or any other medical condition that may be made more severe by an elevation of blood pressure, inter-cranial pressure or the mechanical stress of the inverted position. Moxa therapy or moxibustion is a common health therapy practiced in China, Japan, Korea, Vietnam, Tibet and Mongolia. It is a “warming” technique using the herb mugwort or Ai Ya. Moxibustion helps to increase blood circulation, increase energy, stimulate the digestive system and boost the immune system, increasing longevity. Moxa’s warming and moving properties help to dispel cold from the body, alleviate muscle and joint pain, arthritis, diarrhea, kidney stones, menstrual cramps, mastitis, PMS symptoms, infertility and much more! And, it feels great! 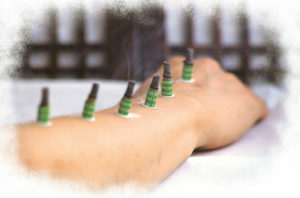 There are many variations of Moxibustion treatment, at the studio, Stick-On Moxa (photo), is most commonly used. • for those with a fever *on areas close to large blood vessels * on the abdomen and lumbo-sacral areas during pregnancy * precautions should also be taken with patients suffering from skin allergies or ulcers * and on areas of skin with nerve damage, where a patient may not be able to sense, when or if, their skin gets too warm.